푸켓, 태국의 블루 몽키 베드 엔 브렉퍼스트 푸켓 | 호스텔월드에서 예약하세요. 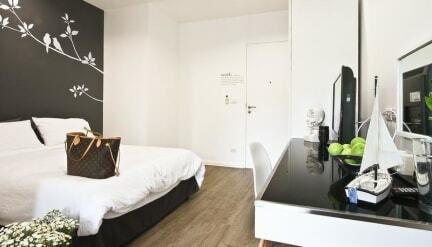 Blu Monkey Bed & Breakfast is an accommodation with 49 rooms. 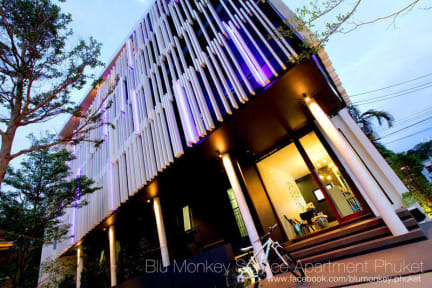 Blu Monkeys Bed & Breakfast conveniently located at the heart of Phuket city, 'SamKong” it is convenience to access and surrounded with local restaurants. The characteristic of Blu Monkey Bed & Breakfast are designed of its theme and services with fulfillment in every detail. Blu Monkey Bed & Breakfast considered on using Natural Energy in order to get benefit from nature by emphasis on airy and clearly environment and sunshine all over the buildings. The reason of “Blu Monkey” because of Blu Monkey Bed & Breakfast is located on the foothills by Rang hill and Phuket downtown viewpoint. Rang hill is a habitats of monkey so we would like to present a monkey as a symbol because Blu Monkey Bed & Breakfast has settle in that area.